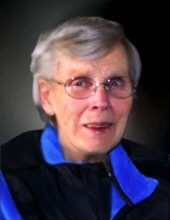 Kathleen Ann Haske, 83, of Reese, died unexpectedly, Sunday, February 3, 2019 at her residence. She was born March 27, 1935 in Saginaw. She was raised in Saginaw and graduated from St. Joseph High School in 1953. On August 18, 1954 she was married to Harry F. Haske in Saginaw. He predeceased her July 1, 1977. She resided on the family farm home since 1954. Kathleen was a homemaker most of her life and was also employed at Agrico Chemical in Saginaw County for thirty years, retiring in 2000. She enjoyed flowers, gardening, shopping trips with her family, but her greatest enjoyment was being a grandmother to her eight grandchildren and thirteen great-grandchildren. She was a strong women, and was known for her hard work and standing her ground. Surviving are her four children and their spouses; Jeanette and Dale Weaver, Mary and Duane Kohlhoff, Anna Brandt, and H Michael and Mary Haske, eight grandchildren; Jennifer, Alisha, Mitchell, Lee, Jenni, Courtney, Michael, and Mckenzie, and thirteen great-grandchildren. Also surviving are her two brothers; David Riska and John Riska, and two sisters-in-law; Dianna Tiernan and Becky Oliver. In addition to her husband Harry, she was predeceased by her three brothers; Thomas Tiernan, Terry Oliver and Mike Smith, and her grandson Jacob Brandt and son-in-law, Kenneth Brandt. Funeral Services for Kathleen will take place at 12 Noon, Thursday, February 7, 2019 from the Ware-Smith-Woolever Funeral Home, 9940 Saginaw St. in Reese. Chaplain Ron Compton of Heartland Hospice will officiate with burial to follow in the Denmark Township Cemetery in Reese. Kathleen’s family will receive friends at the funeral home on Thursday from 10 a.m. until the time of the services. Those planning an expression of sympathy are asked to consider the Haske family. To plant a tree in memory of Kathleen Ann Haske, please visit our Tribute Store. "Email Address" would like to share the life celebration of Kathleen Ann Haske. Click on the "link" to go to share a favorite memory or leave a condolence message for the family.